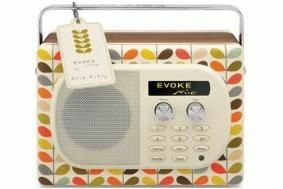 Pure launches Orla Kiely designer DAB radio | What Hi-Fi? The Pure Evoke Mio by Orla Kiely features a cream fascia with the designer's signature stem print, plus walnet-veneered cabinet, mirror-chromed handle and a leather tag. The radio is a DAB/DAB+/FM design complete with auto-dimming OLED display, iPod input, timer/alarm functionality and upgradeability via USB. The radio is mains-powered as standard, but can be fitted with Pure's optional ChargePAK battery for more portable listening. The Pure Evoke Mio by Orla Kiely will initially be exclusively available at John Lewis, from early November, priced £150. The radio will feature in our annual DAB radio round-up in the January issue - on sale 9 December.